“I have always had a very strange connection to the north, both biologically and culturally, at once an outsider and one who belongs. This performance will address that relationship.” L.M. Lindsay McIntyre is a film artist and creator from Edmonton, Alberta. She completed an MFA degree in Film Production at Concordia University in Montreal and also holds a BFA in drawing and painting from the U of A. She has also studied at the Kent Institute of Art and Design in England and at the New School in New York. Specializing in analogue film work that emphasizes documentary, experimental and handmade techniques, her work has been shown at national and international festivals and venues and won some awards. Her short films sometimes circle themes of portraiture, place and form. She generally prefers to do everything the hard way and her current filmic obsessions involve making her own emulsion and film stock, 35mm motion picture pinhole photography and any kind of chemical manipulation of celluloid. 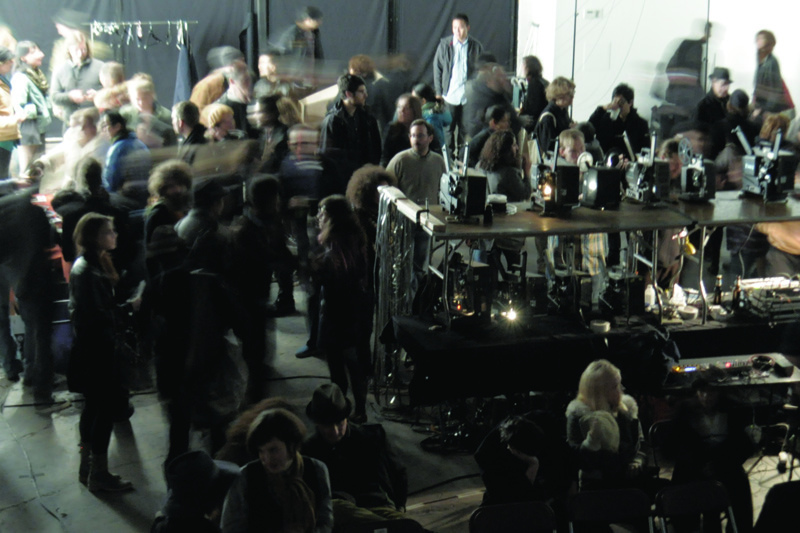 She teaches film production, handmade film, optical printing, hand-processing and celluloid-based image manipulation. She is a member of Double Negative, a small but influential film collective in Montreal, which creates, curates, and disseminates experimental film. She also sells old things, draws and enjoys making things. Edward lives and works in the east village. She is curious about time and most of his work explores the notions of impermanence. He is a street installation artist and likes it best when she has to use generators and tracing paper. You can see her work in empty lots across NY or tucked away on a brick wall. Monica Baptista (Portugal) is a visual artist and filmmaker. She studied fine arts – painting and in the last 5 years she dedicated her field of work and investigation in to experimental cinema and documentary, using mainly analog formats as Super8, 16mm, 35mm to video and photography. With her works, she brings us different contexts, from rural and isolated places, to travelogues and urban societies, she explores the phenomenology of territory, perception and religion, from very specific ways of community living, rituals and urban movements, representing them and inscribing them in her work. Her works have been screened and exhibited worldwide on both visual art platforms, ranging galleries and museums, to film festivals. She co-directed the short fiction BOCA (MOUTH, 2007), directed the documentary TERRITÓRIOS (TERRITORIES, 2009) premiered in Critics week at Cannes Film festival (France), got the award of Best Director at Visions du Réel (Switzerland). DIÁRIO (DIARY, 2011) got the Bes Revelation award. Mónica Baptista is currently doing an artist residency at Location One, New York. Robert Aiki Aubrey Lowe is an artist and multi instrumentalist that works with voice in the realm of spontaneous music often under the moniker of Lichens. Most recently creating patch pieces with a modular synthesizer and singing to them has been a focus of live performance and recordings. Through a recent meeting and collaboration with artist Patrick Smith, Robert has begun to utilize projections with live performances. The current video piece is called “Clouds” which is an animation made by Patrick Smith. Through collaboration Robert has worked with Ben Russell, Ben Rivers, Rose Lazar, Hisham Akira Bharoocha, Tarek Atoui, Ben Vida, Mark Borthwick, Lucky Dragons, Alan Licht, Michael Zerang, Doug Aitken, Patrick Smith, Lee Ranaldo, White/Light, Kevin Martin, Chris Johanson, Tyondai Braxton, David Scott Stone, Genesis P-Orridge and Rose Kallal, as well as many others. Robert Aiki Aubrey Lowe lives and works in Brooklyn, New York. Joey Huertas, aka Jane Public, is responsible for a creating a breed of personal cinema that he calls, Docu-fessional. His works portray the reminiscences of unplanned encounters regarding significant experiences in life using contemporary film aesthetics. Personal revelatory confessions are recorded by unconventional means (public library archives, surveillance, micro-film, journals, hearing aids and toys) and read much like the entries found in a hidden personal diary. One is left with the question of, “What is truth and what is fiction?” The films take many forms, including physical stories arranged by peculiar/imagined biographies of fictitious persons, collections of found/anonymous photographs, found sound recordings, drawings and compositions from text journals. The filmmaker is also a clinical social worker and incorporates the therapeutic process directly into his art. His films offer no “immunity bubble”. His creative process involves a complete study and exploitation of the inner self. The elements of fact and fiction in storytelling are imprecise and distorted, making the relationship between the filmmaker and the audience difficult to manage. In the end, the viewer is left forced to acknowledge the reality of circumstance and coping skills. Patricia Ordonez has been active in the visual arts and fashion design since childhood, sketching out her new ideas for clothing designs and teaching sign language. Patricia has professional degrees in the arts and in fashion design from the Fashion Institute of Technology in NYC, Savannah College of Arts and Design, and Lenior-Rhyne College. She has worked as an art educator at a school for the deaf in New York City and does costume design for several theater productions throughout the city. Patricia Ordonez performs in, THE COLORS OF SPRING in ASL (American Sign Language. Morgan Nance began her viola career at the age of 5, when she requested private lessons in exchange for her agreement to move homes with her family. She went on to attend the reputable Interlochen Arts Academy where she studied with David Holland. She now attends Sarah Lawrence College where she has studied with Daniel Panner and Sungrai Sohn, and has formed a folk/bluegrass fusion band. As part of her studies, Morgan has performed in numerous avant-garde films and has had the opportunity to perform with improvisational dance and theater groups. Morgan Nance performs viola in, THE COLORS OF SPRING. Luke Munn is an interdisciplinary artist based in Berlin with work focusing on the immaterial – sound, movement, memory, light and other media – using the body and code, objects and performances to activate relationships and responses. 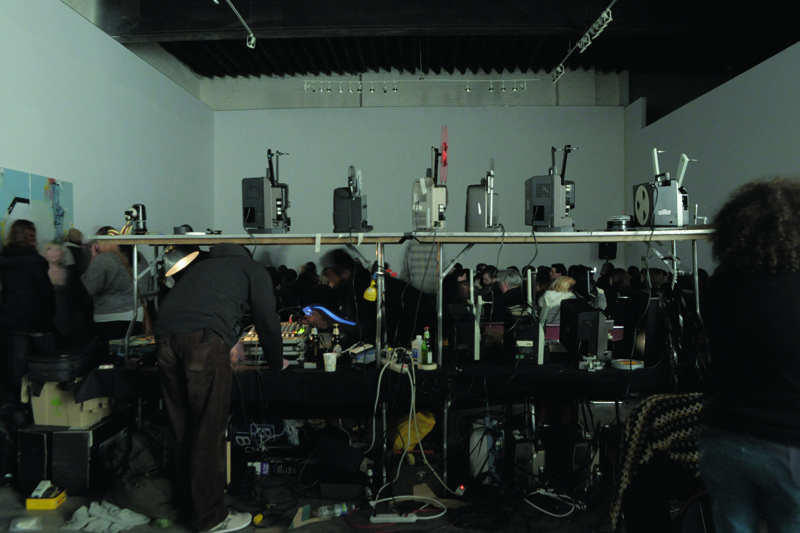 His projects have featured in the Kunsten Museum of Modern Art, the Centre de Cultura Contemporània de Barcelona, Electrosmog Festival, Resound Falmouth, Q-O2 Brussels, Laborsonor Berlin, commissions from Aotearoa Digital Arts, Creative New Zealand and TERMINAL and performances in Paris, Dublin, Chicago, Berlin, Auckland, and New York. Eric Ostrowski is a freely-improvising musician and experimental filmmaker based in Seattle, WA. He played guitar and violin as one half of the legendary improv-noise duo of Noggin from 1993-2006. He is currently exploring solo violin performance – acoustic noise that integrates sound and movement. He is also developing his handmade film and expanded cinema style. Jodie Mack is an independent animator, curator, and historian-in-training who received her MFA in film, video, and new media from The School of the Art Institute of Chicago in 2007 and currently teaches animation at Dartmouth College. Combining the formal techniques and structures of abstract/absolute animation with those of cinematic genres, her handmade films use collage to explore the relationship between graphic cinema and storytelling, the tension between form and meaning. Mack’s 16mm films have screened at a variety of venues including the Anthology Film Archives, Images Festival, Los Angeles Filmforum, Onion City Film Festival, Ann Arbor Film Festival, Black Maria Film Festival, and the Robert Flaherty Film Seminar. She has also worked as a curator and administrator with Dartmouth’s EYEWASH: Experimental Films and Videos, Florida Experimental Film and Video Festival, Portland Documentary and Experimental Film Festival, Eye and Ear Clinic, Chicago Underground Film Festival, and Chicago’s-favorite micro-cinema, The Nightingale. Additionally, Mack is an Illinois Arts Council media arts fellow and the 2010 co-recipient of the Orphan Film Symposium’s Helen Hill Award. Jasa Baka is a multidisciplinary artist who works with analogue projections, theatrical costume and design, drawing, pastry and taxidermy in relation to video, photography, performance art, installation, choreographed dance, animated objects and live musical performance. Magic realism is organically present in her work. She allows creatures to naturally surface in the negative space of her drawing. Her costumes are accentuations of the people who wear them. They enhance the wearers character, giving them liberty to fill themselves out more fully as larger than life living cartoons. She has been collaborating on Smile Stealers, a short film that she wrote, designed and produced since 2009. She is a graduate of Concordia University’s BFA specialization Design for the Theatre (Montréal, Canada). She also holds a Pastry Diploma from Le Cordon Bleu (Paris, France). 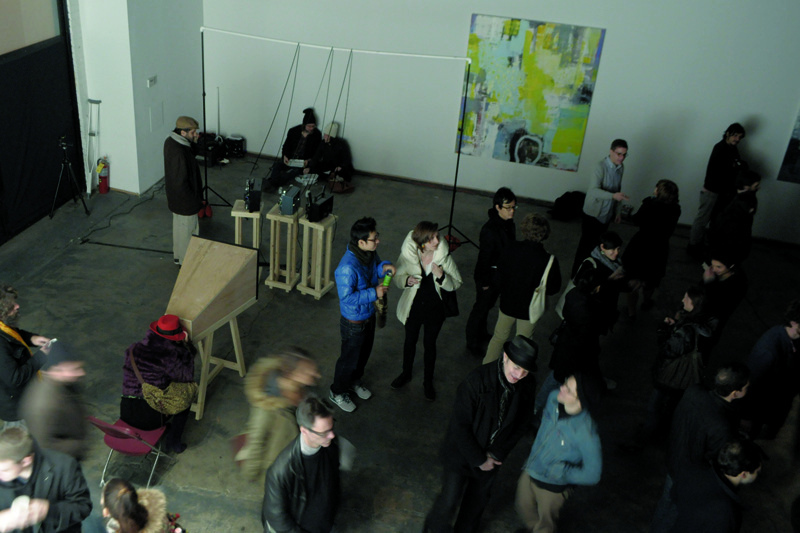 Jasa Baka began collaborating with Julia Thomas on projection/performance installations in 2009. They have since exhibited in galleries, theatres, storefronts and festivals around Montréal and elsewhere in Québec, Canada. In 2010 their collective Brainbow Limb initiated a multimedia performance research intensive funded by the Canada Council for the Arts. Julia Thomas is a graduate and faculty prize winner of Contemporary Dance at Concordia University. She navigates as a choreographer and dramaturge between performative disciplines and leads alternative dance workshops for participants differently-abled and otherwise (“for Everybody”) in Montréal. Tyr Jami is Vancouver born cellist, vocalist and performer living in Montréal. She began playing cello in 1991, studying at the Vancouver Academy of Music. She has since graduated from the Vancouver Community College with a music diploma (2005) and from Concordia University in Montreal with a specialization in Music Performance (2011). In 1999 she formed the psychedelic-folk band The Winks. They made several North American and Australian tours and released 5 full-length albums. Her new project, Syngja, is a combination of traditional Icelandic folk songs, psychedelic-pop and a-cappella tape recordings of her Icelandic Great-grandmother. Syngia debuted at the 2011 International Pop Montréal Festival and has toured British Columbia. Along with pop music Tyr has played with a number of Symphony Orchestras including the West Coast Symphony, Musicians of the World Symphony Orchestra. She recently scored and performed a live soundtrack for the theatrical production Haunted, by Paul Van Dyke. Tyr operates La Tour Prisme performance venue in Montreal and teaches cello. She also played the lead role in the movie Smile Stealers and is currently working on the soundtrack. Alex Mallis is a filmmaker living and working in Brooklyn, NY. His films have been screened and featured at IFF Boston, Hot Docs, DOCNYC, UnionDocs, The Guggenheim Lab, The Huffington Post, The New Yorker, and The Atlantic, among others. He is currently finishing post on Spoils, a direct cinema style short about dumpster diving. Alex is pursuing his MFA in Integrated Media Art from Hunter College. He greatly enjoys the darkroom. Do you ever think about teleportation? Hunter Simpson is a musician based in Williamsburg, Brooklyn. He plays guitar in two bands, Daytona and Wild Yaks. Theodore Rex King holds a Bachelor of Arts degree from Bard College (2008). Theodore is a filmmaker living in Brooklyn and currently works in film production as a freelancer and member of the International Cinematographers Guild. Jordan Stone holds a Bachelor of Arts degree from Bard College (2008) as well as a Master of Fine Arts degree from the School of Visual Arts (2011). Jordan is a filmmaker living in Brooklyn and currently teaches editing, production, and film theory at both Dutchess Community College and Marist College in Poughkeepsie. Originally from Virginia, but currently living and working in Ithaca, NY. Currently a student at Ithaca College, Alex works in sound, moving image, and photography in an experimental format. “Experimentation, for me, is the most crucial element of art-making. We must push the boundaries of both the materiality and format of our art, and also experiment with common notions and reactions to art. Otherwise we’re just making the same meal over and over.” Alex is also a book artist and an independent publisher of artists’ books and collective photobooks. Amanda Long is a sculptor investigating light, color, perception and the abstraction of the human form through technology. Her work has been exhibited at Bring to Light NYC, the Dumbo Arts Festival, the Mattress Factory Museum, and the Children’s Museum of Pittsburgh. Long received a MFA in Art from Carnegie Mellon University in 2010, a BFA in Sculpture & Extended Media from Virginia Commonwealth University in 2005 and a BS in Cell & Molecular Biology from Tulane University in 2000. Her new media project, Lighter and Lighter is the recipient of the University Film and Video Association’s Carole Fielding Grant 2010. Presently Long is developing a traveling exhibit of her interactive video installation White Light for young audiences in Pennsylvania, sponsored by a Spark Grant from the Sprout Foundation. She lives and works in Long Island City, NY.